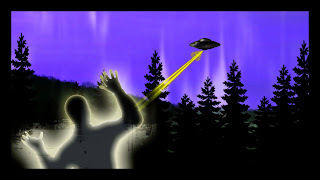 Arcesio Bermudez was a 54-year-old Colombian who apparently succumbed to the powers of the mysterious UFOs, creatures whose existence is unknown, but who are nonetheless real, according to experts. Ufologist William Chavez claims that the event took place on the evening of July 4, 1969 in the town of Anolaima, municipality of Cundinamarca, when Arcesio's family climbed a hill to do some star gazing, and managed to see a small light that increased its size substantially. "Mister Arcesio went out to see what was going on. He stared at it and decided to point his flashlight at the unknown entity at that moment," says the specialist. Chavez claims that the peasant received a magnetic blast, causing him to feel sick hours later, developing signs of hypothermia shortly after. He was sent to a clinic in Bogotá. After being hospitalized for several days, experiencing intense fever, the Colombian died under circumstances that medical experts could not explain. The national police and the army conducted an investigation into the death of the man who seemingly came into contact with an unidentified flying object. However, the authorities were never able to clarify the events. This small piece of information by Colombia's Radio Blu does not mention the fact that the case received considerable attention at the time, and not just within Colombian borders. 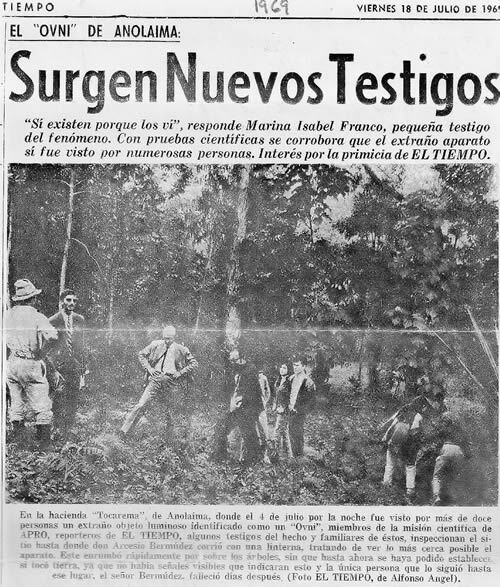 An issue of the TIEMPO newspaper dated 18 July 1969 shows members of the APRO research organization, under the direction of Jim and Coral Lorenzen, along with local authorities and eyewitnesses. The text reads: "They do exist because I saw them," replied Marina Isabel Franco, a young witness to the phenomenon. Scientific evidence corroborates that the strange object was indeed seen by many people. There is interest in this exclusive by EL TIEMPO." 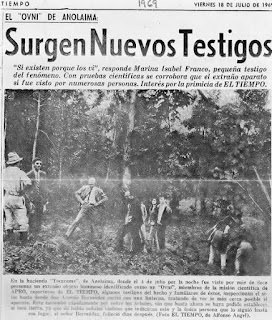 The photo caption adds: At the Tocarema Hacienda un Anolaima, where on the evening of 4 July, more than twelve people saw a strange luminous object identified as a "UFO". Members of the scientific delegation of APRO, reporters for EL TIEMPO, some eyewitnesses to the event and their relatives, inspect the site up to which Arcesio Bermudez ran with a flashlight, trying to see the vehicle as close as possible. It flew quickly over the trees, and it has not yet been possible to determine whether it touched the ground, since there are no visible signs that suggest this. The only person who followed it to that site, Mr. Bermudez, died days later. (Photo credit: Alfonso Angel, for EL TIEMPO)." More details emerged about Mr. Bermudez's sudden illness after his alleged CE-3. Feeling ill within hours of the event, his malady extended for three days until a relative came to collect him and take him to Bogotá for treatment by car. According to his family, Bermúdez was cold to the touch, and that he leaned against his sister's side in the vehicle. Creepier still is the detail that the side of the sister's body "remained cold until the day she died." Bermudez's preternatural chill was such that the nurses at the Bogotá health center were unable to draw blood samples, as his vital fluid had "crystallized"." Arcesio Bermudez was treated by César Emerald, Secretary of Health in Bogotá at the time. This distinguished physician would recall that his patient was in a state of hypothermia, with no temperature readings. Dr. Emerald was never able to ascertain the root cause of this chill. 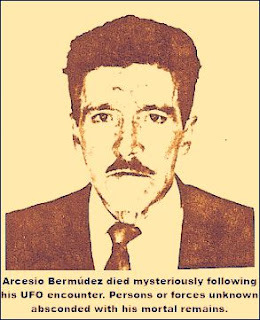 The group of APRO investigators seemed to think that Bermudez had died from a massive dose of gamma rays, and requested that the hapless man's cadaver be exhumed - something the family refused to do. Years later, when the remains were about to be transferred, the Bermúdez family discovered to their horror that the body had been spirited away by unknown hands. A more detailed medical report can be found in the 17 July issue of the "El Espectador" newspaper. Dr. Emerald is quoted as saying: "The patient was very ill. He presented a cardiac condition, third-degree dehydration brought about by vomiting and diarrhea, and it was impossible for me to control his sickness. Nothing could be done for him. It struck me that the patient should be hypothermic, that is to say, that he should have no temperature whatsoever. All I can tell you is that according to his sickness, the patient should've had a temperature reading, but in fact did not have one. I am speaking from a medical standpoint; therefore I cannot associate his death with the presence of the object [UFO] you are telling me about."